A hush falls over the energetic crowd. Everyone holds his or her breath for a moment, awaiting the final verdict. Numbers are announced over loud speakers as the crowd once again erupts with joyous applause. After the performance of a lifetime, a dream has been realized; an athlete has won Olympic gold. As we watch the Olympics unfold, it’s important that we realize each event; every personal best and Olympic medal is the culmination of years of hard work and dedication. 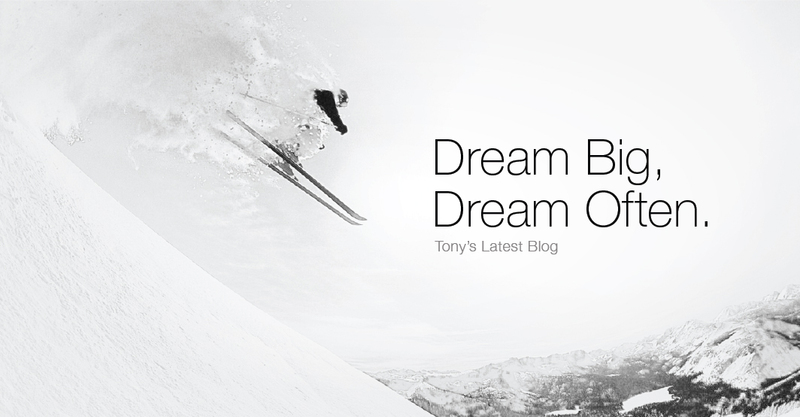 The methods athletes use to get to the Olympics differ greatly between sports but all Olympic participants have one thing in common – the ability to dream big. Many of the most successful athletes will go on to be leaders in their sports: some as coaches, some as program directors, others as officials or motivational speakers. Why do these people excel in leadership positions? It comes back to their ability to dream big and to believe in their dreams. If the ability to believe in your pursuits is paramount to success, why are so many of us plagued by self-doubt and insecurity? Well, for starters we live in a society filled with “haters”; those people who are happy to shoot down the dreams of others largely because they are too afraid to dream big themselves. In order to be a bold leader, you need to believe in your dream more than you have ever believed in anything before. So much so that even a thousand naysayers couldn’t knock you off your path. When I started a cultural revolution at Roma a few years ago, there were plenty of detractors. There was no shortage of people who either behind my back or to my face told me that my dream would never materialize. They couldn’t knock me off my path. No one could, except for myself and my belief in my dream was so resolute that even a goal of blurring the lines between work and play wasn’t too big in my mind to achieve. When faced with a predicament that I’m unable to navigate, I look to leaders from the past, not only for techniques and best practices but also for inspiration. History provides many examples of perseverance and determination but I often return to the lessons two individuals. Martin Luther King Jr. and Mahatma Gandhi. Each dreamed as big as any human ever and both gained a following of loyal supporters that kept them on their path in the face of ridicule, prejudice and threats of violence until both paid the ultimate price to realize their dreams. While I would never suggest jeopardizing your life, these examples illustrate the lengths two extraordinary leaders went to in order to change the world. Let’s face it. It’s not every day that someone wants to make the world a better place and then actually acts on it! •	Dream Big: Your dream has to inspire you first and people must see the inspiration in your eyes! It can’t be a maybe dream, or a someday dream; your dream has to be with you at all times. Once everyone can understand your dream, you will begin to attract people who believe in your cause. Start by sharing your dream with a few people; if they think you’re crazy, you’re on the right track. If not, dream bigger! •	Persevere when others would quit: Set up a support structure for the down days because you will need it. Even the best leaders need support! Create a support group through your social media contacts or those physically around you. When times really get tough, find that safe place and watch an inspiring video on Vimeo, read a passage from your favorite book or speak to that person who never fails to inspire you! You’ll face adversity at some point and while you don’t need to convince everyone to join you as you change the world, you will need to be determined. Do you think your dream is dream worthy? If not, don’t fret – just dream a little bigger! Tony, great blog! I’ve found that breaking your dream down to obtainable goals is the best way to making things happen! Thanks for the inspiration! great blog Tony! great a true words! I really enjoyed your blog Tony and the historical reference with respect to finding solutions is wonderful. Thank you for the inspiring Blog. Awesome read!! Dreams do come true!! Thank you for the inspiration and empowerment! Great read! Dreams are only the first step. Not being afraid to take your dreams and make them real, at whatever cost, is what you did! Others can really learn from you. Great read, very inspirational. Great, meaningful blog! Dream BIG, Think BIG and Never give up. Love it :-). So True & Perfect Timing – All Our Olympians Took Action Towards Their Big Dreams Backing those Dreams Up With Big Action :-). Great Post! Good read, thanks Tony. Reminded me of a book by Steve Siebold, “177 Mental Toughness Secrets of the World Class”. No one dreams of winning the bronze medal, Olympic athletes only hear their countries music in the background when they are on the podium.